Tattoo will last several days with care. Simply remove with baby oil or rubbing alcohol. ONE Tattoo Sheets per package, as pictured. Each sheet approx 6-inch high x 7-inch wide. Individual Tattoos vary in size between 1-inch (2.5cm) to 3.5-inch (8.75cm). 2. 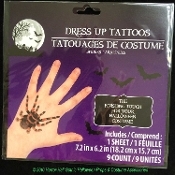 Select the tattoo and cut from sheet with transparent paper still attached. 3. Carefully peel away transparent protection paper, taking care not to touch the sticky surface of the tattoo. 4. Place tattoo face down on clean dry skin and rub backing paper with a damp cloth or sponge for 10-20 seconds. 5. Gently peel away backer paper slowly, checking for adherence, or replace backer paper and re-wet before proceeding. 6. Allow tattoo to dry. 7. Tattoo will last several days with care. 8.To remove tattoo, wipe gently with soft cloth dipped in rubbing alcohol or baby oil. Ingredients: Acrylates Copolymer, Ethyl Acetate, Iron Oxides, Yellow 6 Lake, Blue 1.